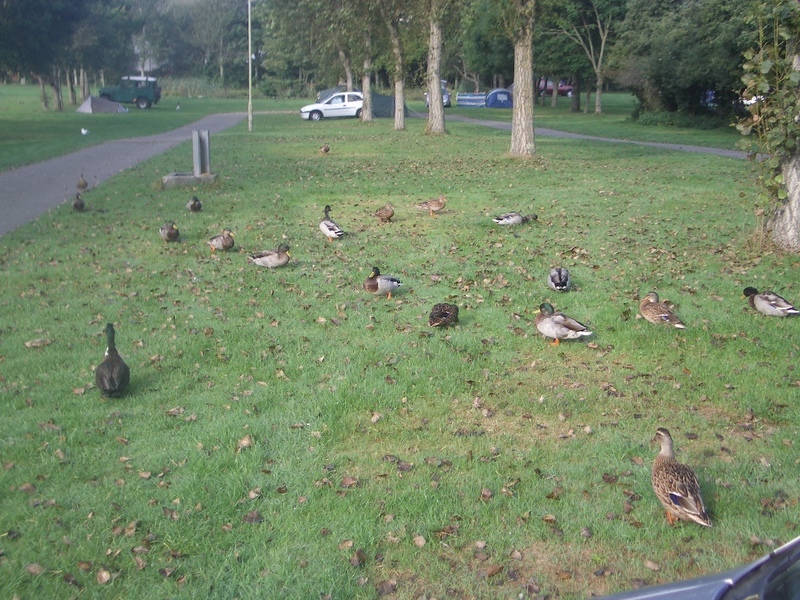 That campsite with the ducks… that’s the first place I lived. Kind of. When I was 18 years old, I finished my studies, bought a tent, got into my car, and drove nearly four hundred miles across the UK to start a new life. As the UK is quite small, four hundred miles is pretty far. I first headed to the town of Newquay – famous for surfing – picturing sunshine, beaches, and rolling waves. Unfortunately I arrived at the start of autumn and was met with rain as I begun my search to find a place to live and work. The plan was to find a job, find a house, and surf. Something like that. Things didn’t go quite to plan. Every time I tried to get a job, they would ask where I lived and what qualifications I had – I lived in my tent and had just graduated from sixth form (kind of like high school in the US), making me a less-than-ideal candidate. And when I tried to find a house, I would be asked where I worked to make sure that I had money to pay the rent. I was stuck in this horrible catch-22 cycle, living in my tent. This went on for about ten days until the final straw of tent life in the UK came when I woke up in a pool of water with all of my belongings soaked. I spent the next couple of nights sleeping in my car at the back of Tescos (a supermarket). In short, it was pretty awful and nothing that I had hoped for. Each day I scoured the local papers – this was before the internet was easily accessible – for jobs and houses, and each day I was disappointed, until finally I found a family who had an old caravan in a field. It was one of those tiny caravans that gets pulled on the back of a small car and it leaked in the rain, but for £70 a week (about £100 a week in today’s terms), I had a place to live. Shortly after, I got a job in the bakery of a local supermarket and had my life sorted. Kind of. 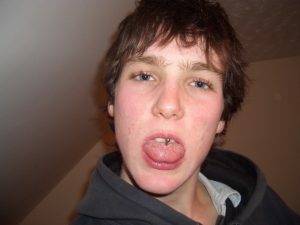 I dyed my hair electric-blue black and pierced my tongue, asserting my independence, and every morning I would get up around 6am, cross the frosty grass to the shower block, and take a shower whilst being able to see my breath. I used to dread getting up because of the cold and the day that awaited me – jamming donuts and packing bread. After my shower, I would run back to my damp caravan, get dressed into my supermarket uniform, and then start the car so that I could defrost the windows. My girlfriend at the time was living with me and although she didn’t start work until midday, she would have to come to work with me and sleep in the car because she couldn’t drive and we lived in a small field, miles from anywhere. After I finished work, I would come home and read, write, or draw until my girlfriend finished work, then go to pick her up. Another guy lived in our field, an alcoholic in his 40s, and he would often come to spend time with us. 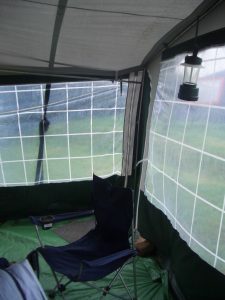 We had lights and a stove in the caravan, but nothing else, and at the weekend I went to a youth community centre to use the much desired internet and look for jobs or a better house. I never found a better job because I had no skills, no experience, and very basic qualifications. I did find a better place to live and moved into a room in a shared house. I had no belongings except a bag of clothes, a heater, and an air mattress, so I lived in this blank canvas for a while with several older people, one of whom had a kid. It was warmer than the caravan and didn’t leak, but there isn’t much to be nostalgic about. The air mattress would never quite inflate all the way and always went flat in a couple of hours, and I knocked the heater over after we moved in, causing it to catch on fire. After several months of this life, I was done. I packed up my stuff and drove back to my home, four hundred miles away. I hadn’t surfed once. I had mixed feelings about the whole experience. On one hand, I had proved that I could survive by myself. On the other, life had not been very enjoyable. I worked full time back at home on building sites, as many hours as I could get, saving every penny. Four months later, I bought a round the world ticket and headed off on a six month journey visiting USA, Cook Islands, Fiji, New Zealand, Australia, Thailand, and Malaysia. I loved every moment of it and was caught by the love of travel, but after six months I got to a mental place where I was quite tired. It was great exploring for so long and seeing so many new places, but I didn’t have any focus. I look back now on how I had been excited to leave school for a long time. I never liked school, even when I was young, and felt I was trapped in a place I didn’t want to be. I always got good grades, until right at the end when I lost all motivation and barely even finished my studies. That happens to a lot of us when we feel disillusioned with the world, but luckily my good record before my final exams offered me a place at university. Back in the UK after six months overseas, I started university, mainly because I didn’t know what else to do with my life and I didn’t want to live in a leaky caravan, jamming donuts. For me, this was a wonderful decision that shaped my life in a positive way. My university offered me the chance to live in North America for a year, hitchhike to Morocco, and volunteer in Uganda, as well as allowing me to find out more about who I was as a person. I haven’t used the course content in the past few years, but by the time I finished university, I had more certainty about myself and about what I would do. And when I want to go on further travels to fund my nomadic lifestyle, I am able to find work much easier. Often, I travel cheap. Really cheap. But I work when I need to, in order to fund my lifestyle, and have worked hard to make opportunities better for myself. I think that is a key element in life: try, try, and try. Try really hard to do the best that you can do in all you do and make decisions that lead you towards the life you want to live. I look back on my time jamming donuts, living in a leaky caravan, and the convoluted path I took. I’m grateful for the experiences, but glad of certain decisions: I’m glad I studied to a higher level, offering more opportunities for myself as I travel the world; I’m glad I have tried to learn as much as I can outside of school to further my personal interests that have led to the opportunity to fund my lifestyle in a way that I want to live; I’m glad that this world is awesome and there is so much more of it that I am excited to see. Right now I am living in Malta so that I can see my family more and have a base to go back to at the end of adventures. It’s a long path from that leaky caravan. I left home at 18 with a tent and more than a decade later, I still like to go on tent adventures. One thing I have found out in all this time is that when I need a break from being a nomad, having somewhere to go and skills to draw on are invaluable. Without them, I would not be able to live the life that I lead.